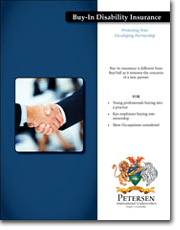 When an individual is invited to become a partner in a professional practice or business, there is usually a period of time that involves the buying in. During this period the deal is riding on the fact that the individual becoming a partner has the finances to buy into the company. A disability could really throw a wrench in the plan. Should the person becoming a partner become disabled during the buy in period, there could be significant problems with the completion of the deal. Without the ability to continue working, the disabled might not be able to afford to buy into a company. Unfortunately, because the disabled is not a full partner at the company, a traditional Buy Sell Disability Insurance plan will not cover him or her. In this type of situation one of PIU’s many high limit Disability Insurance policies would cover the Buy In agreement. Buy In Disability Insurance reassures both parties that the partnership will be completed and that the financial obligations stated in the contract will be fulfilled. Mr. E owns a successful manufacturing business. Mr. E would like to sell his business to his son Mr. e who has been working at the business for the last 15 years. Mr. e will buy 10% of the business each year for the next ten years just by reducing his salary 25%. Several problems were encountered when the producer approached his traditional disability insurance carrier. First they did not like the idea of insuring family members in a Buy In/ Buy Sell situation. Second since the Buy In was not complete the traditional carrier would not underwrite the risk. And they did not like the fact that there was a significant age difference between the two partners. None of these problems were issues for Petersen International Underwriters.